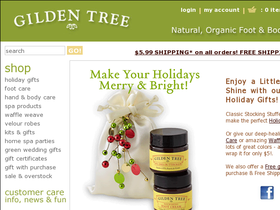 GildenTree.com offers a complete selection of naturally therapeutic foot, hand and body care. GildenTree's line of products also includes foot cream, scrubs, balm, lotion and cleansing gel, as well as a beautiful line of natural cotton robes, towels and accessories, all using certified organic ingredients. Be sure to check back often at 58Coupons.com for the best GildenTree.com savings, GildenTree.com discounts and GildenTree.com coupons. Enjoy free shipping from GildenTree.com on orders over $75. Enjoy a 15% discount on your order from GildenTree.com with this coupon code. Spend $35 and use this coupon code at GildenTree.com to save 10% on your order. If your order is less than $75 and you don't qualify for free shipping from GildenTree.com, you still can enjoy $5.99 flat rate shipping. Be sure to check out the sale and overstock items at GildenTree.com for savings of up to 80%!